If there is one country that has less faith in the Communist Party than China, it would have to be Cuba. They have all of the social inequities associated with China’s extreme income disparity, but the exploitation is seemingly reserved exclusively for foreign tourists. Of course, it is not like Cubans haven’t had revolutionary theory explained to them. For decades, they have endured Fidel Castro’s interminable speeches. 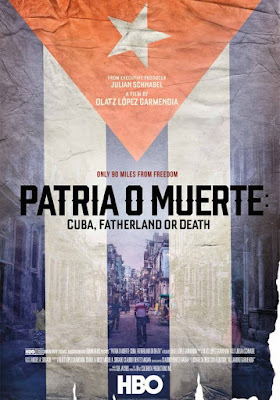 Those diatribes produced the hollow slogan adopted as the ironic title of Olatz López Garmendia’s revealing documentary Patria o Muerte, executive produced by Julian Schnabel, which premieres this coming Monday on HBO. Strictly speaking, Garmendia (second wife of Schnabel, who directed her in Before Night Falls) takes the observational approach, observing many average Havanans in their homes and listening to their complaints. However, her desperately poor subjects have so much to say and their situations are so precarious, the film never feels like a Wisemanesque fly-on-the-wall experience. Very few of them even bothers talking about freedom anymore. That is long gone. Their thoughts are solely concerned with day-to-day, hour-to-hour survival. We meet Mercedes, whose family risks their lives every day just by living in their (literally) crumbling building. They know it is only a matter of time before it collapses (her son was already hospitalized by a floor cave-in), but they have no other place to go. A thirty-eight-year-old street vendor would understand. He says he feels like a teenager because he still lives with his parents, but there is no chance he could find or afford his own apartment given his circumstances. Occasionally, some Havanans express frustration with the lack of intellectual and artistic freedom, such as Yoani Sanchez and Renaldo Escobar, dissident bloggers in a country that forbids the internet. However, for average Cubans, it is more a matter of being denied one of the most convenient tools of the Twenty-First Century. Anyone who stills thinks Obama’s overtures to the Castro regime will materially improve their lot should be quickly disabused by the work of Garmendia and her crew, particularly cinematographer Claudio Fuentes Madan, who is seen getting arrested (violently) for protesting on the day of Obama’s state visit. He also does nice work behind the camera, evocatively framing each interviewee and their [barely]-living spaces. 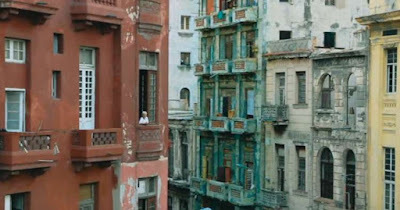 Through his lens, we get a visceral sense of just how oppressive life in Cuba really is—for all but the Party pinnacle of privilege. Patria o Muerte does not white-wash or sugar coat any of its subjects’ reality. Yet, it is not a spirit-crushing viewing experience, in part due to its eclectic but very upbeat Cuban soundtrack (even including old school Benny More). It just serves up one harsh dose of truth after another, but it washes it down with some rich Afro-Cuban derived or inspired rhythms. In fact, there is an elusive, haunted and decrepit beauty to the city and its people that comes out clearly in every frame of the one-hour film. Very highly recommended, Patria o Muerte: Cuba, Fatherland or Death debuts this coming Monday (11/28) and hits HBO On Demand the next day.